lahznimmo architects and Spackman + Mossop Landscape Architects formed a joint venture (LNSM) to provide the Sydney Catchment Authority with architectural, urban design and landscape services for the preparation of a masterplan for Warragamba Dam, which was required subsequent to the construction of the new $500 mil auxiliary spillway. 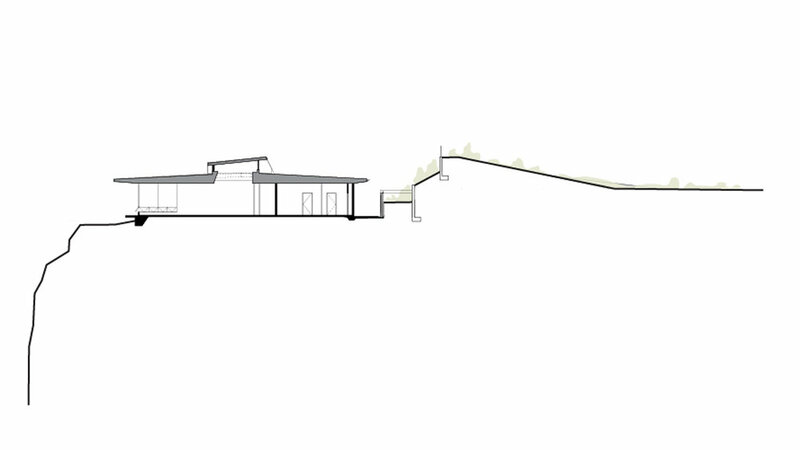 An extension of this commission was the design of a new Visitor Centre, Operations Complex (VOC) and Viewing Platform. The VOC is sited at the end of Haviland Park to take full advantage of the spectacular vista that overlooks Warragamba Dam and the new auxiliary spillway. On approach the roof of the building appears to be a continuation of the landscape beyond as the architecture is downplayed and the view across the auxiliary spillway to Warragamba Dam is maintained. However, from the cliff side the building perches itself boldly on the edge with a series of public viewing platforms that cascade down the rock shelves. The building comprises two key components. The first is a visitor component equipped with both a large multipurpose room and an exhibition room whilst the second is the operations component which accommodates the Sydney Catchment Authority Education, Operations (Catchment and Water), Maintenance and Projects teams.